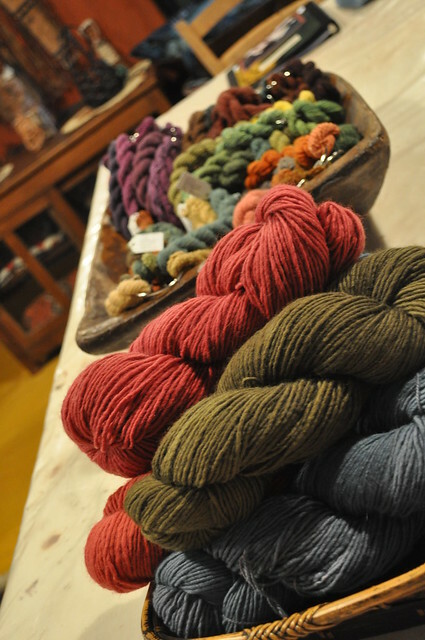 I finally got a chance to take a dyeing class at Earthues today. 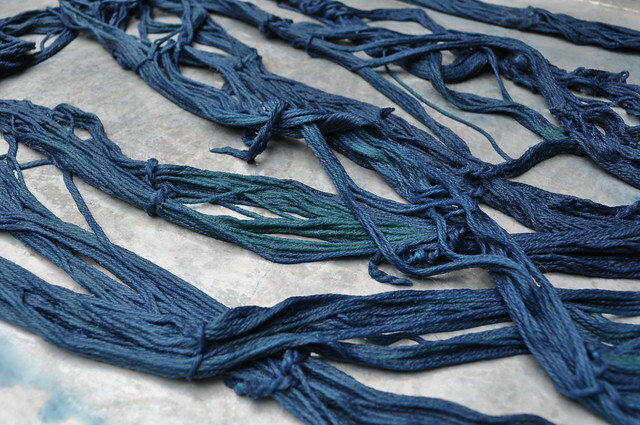 We dyed several types of yarn with several natural dyes including indigo. I always enjoy trying something new in a class setting first. 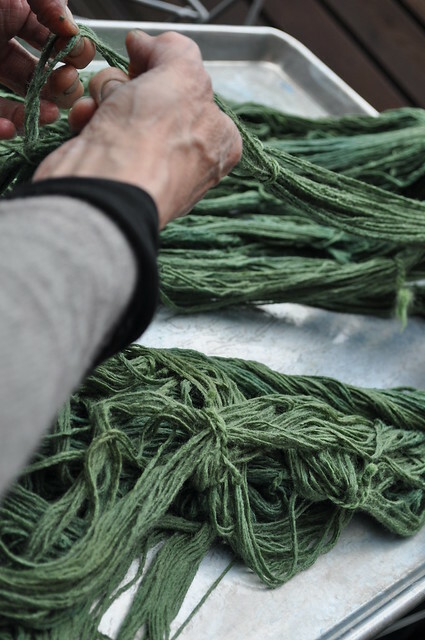 Natural dyes aren't too complicated but they are definitely more involved than the acid dyes I usually use. 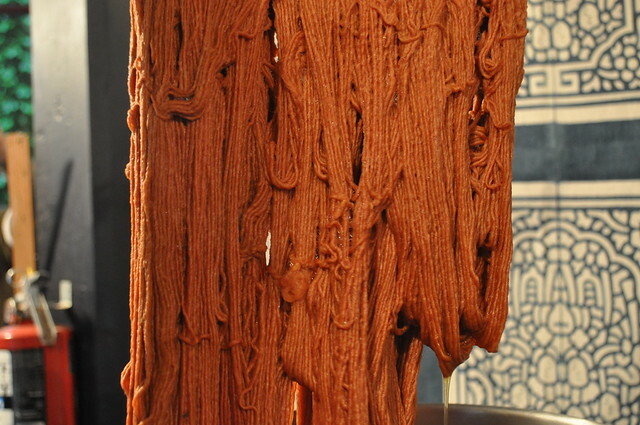 This is Madder root with Myrobalan after only a short time in the dyepot. The color developed over several hours into a very rich reddish-orange. Here is Osage with Weld. We also made learned how to make an indigo vat. The process is a bit involved but it produces such great color. 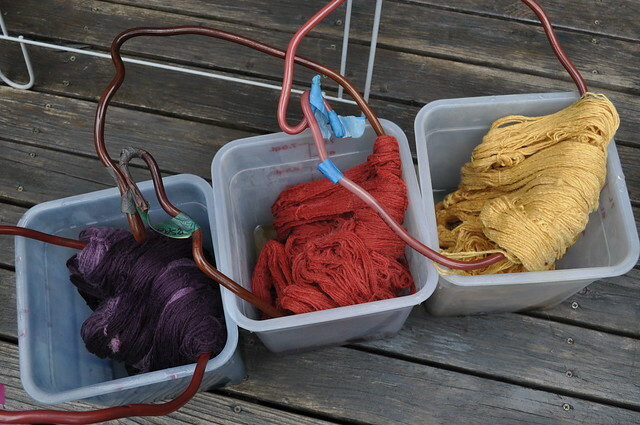 We overdyed some of the Osage-Weld dyed yarn. Indigo reacts with oxygen. 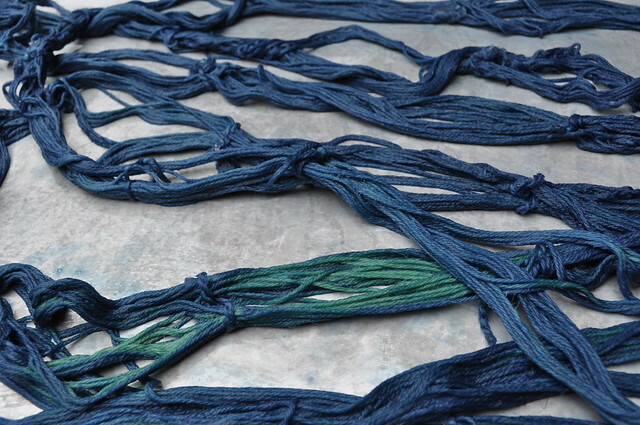 To create even color once the yarn is dyed you need to spread it out so that all the indigo in the fiber gets in contact with the air. 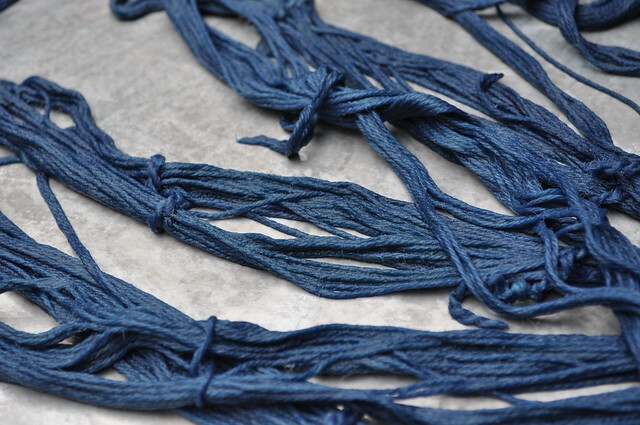 We dipped some undyed yarn in the indigo for a few minutes. It comes out of the dye green then quickly starts to turn blue. But underneath there's still green hidden. Which quickly turns blue when exposed to the air. Here is Indigo over Osage-Weld, Logwood with Quebracho Red (this was a class favorite for its intense color), Madder-Myrobalan (see how it changed from the photo above? ), Osage-Weld, and Indigo alone. Not pictured is the Cochineal which was still simmering in the pot. These handles for the yarn are plastic coated copper tubing. The yarn skeins are looped through this handle making it very easy to rotate the yarn around from the top of the pot to the bottom to allow for even heating which gives more even color. I bought an indigo kit to bring home. I am so in love with the colors that it produces. Now I just want to pull out all my fiber and start dyeing! 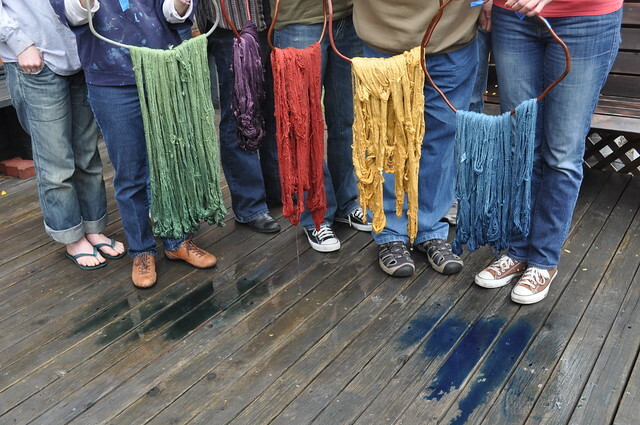 I took a class at evergreen where we learned how to dye with indigo. Keeping the dye alive for eight weeks took more work then I expected and smelled terrible, however the results were amazing. 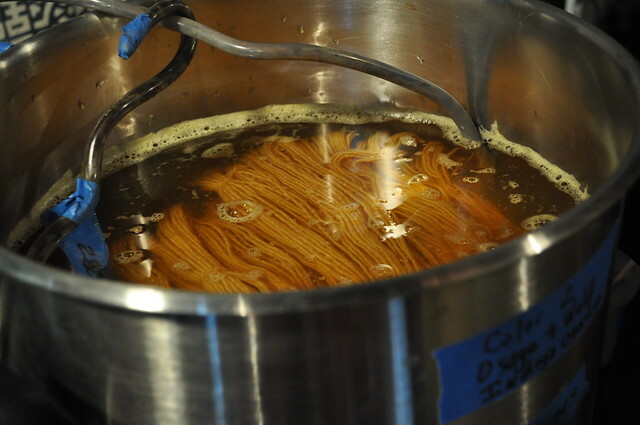 We dyed cotton, do you know if the process is different for wool? Beautiful colors! I especially love the orange one (my new obsession). Looks like a fantastic class!